I used to search the Dubai and Abu Dhabi art fairs, in quest of Maqbool Fida Husain's works. I did it out of passionate curiosity for an artist whose oils I knew I would not be able to afford. I also always asked to see any etchings, drawings or watercolors, wishing I would find an "affordable" one that I might acquire. Just because the "affordable" was in relative terms, I denied the horses or the sitar players and went in search of tigers or nudes or anything extraordinary. I never purchased a Husain. I knew he was an almost centenarian and I hurried because I knew that once his long life and prolific career ended, collectors wouldn't want to separate from the precious works. I would spot him at the Emirates Towers frequently, at his favored Noodle House Restaurant and each time I itched to disturb him, at best to ask him for a drawing on a paper menu, or just to tell him about my admiration and respect. 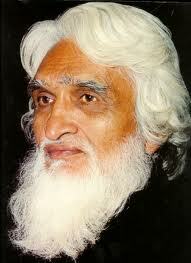 His deserved label as the Picasso of India sometimes led to false valuations of the genius artist. Some would deny him the title, saying that he had painted 60,000 paintings in his long life and that they were not rare. If anything, his fate would be that of Salvador Dali, whose works (apart from the top selections) devaluated postmortem (because of the fakes that flooded the market). Other artists would be likened to Picasso, as meaning Pablo himself, the passionate artist, or Pablo, the Cubist. I would like to explain that Picasso has become an expression of greatness in art and those bestowed with that accolade are very refined artists, who paint with passion and have a unique style. 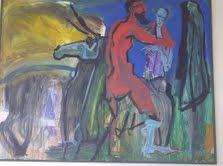 I agree that some of Husain's painting do have the Guernica look of Picasso because his horses (a Hussein fetish) have the same open nostrils and distressed mouth. 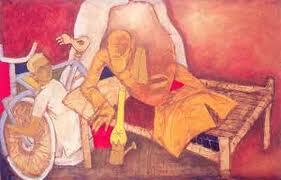 But Husain is Indian and his colors carry the flavors of his country: the mustards, reds and browns. His iconography is Indian, with the sitar, the beggars, the Mother Theresa and the Bollywood stars in saris. What I admire most about Husain, he who has innovated the cultural expressions of his beloved motherland, is his expansive style. I am stunned by the physical aspect of his brush stroke. I know that he doesn't paint with dainty Cezanne strokes but he rather dashes all over the large canvas, his paintings mere expressions of his large movements. I also like the humor that transpires, when he uses white or blank, especially on deliberately unfinished human faces (as if to confer anonymity). An Iranian artist with similar talent is the young Rokni Haerizadeh who is also appreciated for his expansionist canvases. Rokni paints layers upon layers, with a quick spontaneous brush, in colors beyond any traditional palette. I have counted one dozen greens in a single painting! Like Husain, Rokni also paints viisions of his motherland, its folklore and the more alternative, the intimate and the political, the humorous and the violent. Without a doubt, Rokni is the Picasso of Iran, and I believe I may now dub him with a less cliche title, one that suits him to perfection: the M.F. Husain of Iran. A feable old man with snow white hair enters one day to a dental clinic in Jumeirah,bare-footed with socks.He asks to see the dentist without an appointmant.The kind and yet clever and lucky dentist ushers him in,fixes his emergency ache,and refuses to take money from him.The next day,someone delivers a painting signed M.F Hussein with thanks.The two men became friends till the end. A very young gallery owner courageously opens an art gallery at a hotel in Dubai,and introduces an unknown younger Iranian artist to the new art scene in Dubai.People hesitate,but enthusiasts with an eye grab them for a very reasonable price.Now the artist Rokni becomes a pillar of resident artists in Dubai,and the courageous collecters made a handsome profit.